I did it! I made a skirt! I haven’t made one before, but I challenged myself to do just that for our upcoming beach vacation. What better place to wear a light and cheery cotton skirt? 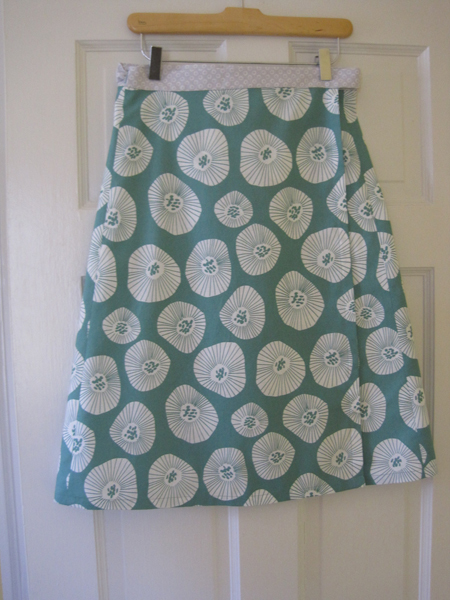 After pouring through my sewing books, I decided to make the Breezy Beach Wrap (perfect) skirt from Sew What! Skirts by Francesca Denhartog and Carole Ann Camp. 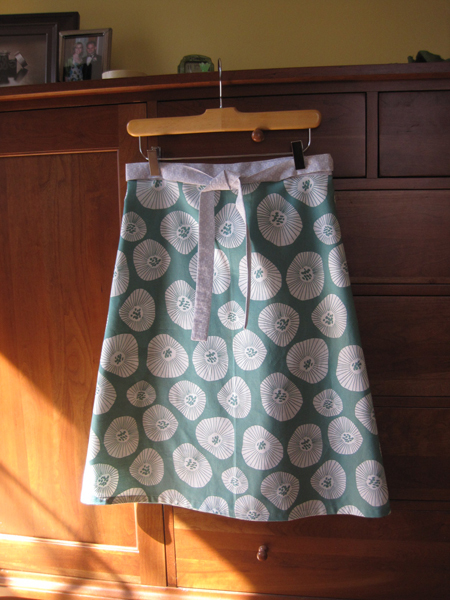 The book contains instructions for 16 skirts, all made by creating your own pattern using your measurements. Once I had decided on the skirt to make, I needed to get the fabric. On the way home from the Columbus area one weekend, my husband and I stopped by The Fabric Shack in Waynesville, Ohio, a truly wonderful fabric store with an extensive selection of cottons for sewing and quilting. (There is a separate store a block up the street that carries decorator and specialty fabrics, too.) We passed through the whole store twice and decided this fabric was the best choice. It just looked like something I’d wear. It wasn’t until a few weeks later, when I started in on the skirt, that I realized it’s a Lotta Jansdotter print. Lotta Jansdotter! You mean the same designer whose plates, bowls and mugs we loved so much we had to have them on our wedding registry last year? Yep. Sew What! Skirts includes a formula to draft the skirts that uses your waist measurement, hip measurement and the distance between the two. After measuring twice, just to be sure, and plugging those numbers into the formula, I drafted the pattern right onto the fabric. It was a bit scary, but much easier than I had imagined because the instructions were so clear. The skirt instructions included an option to add a buttonhole to slip one of the ties through to get a smoother profile. Since my profile can use all the smoothing it can get, I did add the buttonhole to the waistband, following the instructions that came with my machine. It was my first buttonhole, too, and again, it really couldn’t have been any easier. The skirt wraps in the back, rather than at one side, so it’ll be a little hard to know if it has flown open. But there’s a good amount of overlap, so hopefully not too much shows if it does. One of my biggest concerns about making a skirt was getting the hem right. I’m not really known for my even and straight double-folds. So I decided to invest in an aluminum hem guide (about $16). It has guides for both curved and straight hems, and I ended up using both to give the right flow to the hem. I can see myself using this for all sorts of projects, though, including quilt labels. A very handy notion to have. 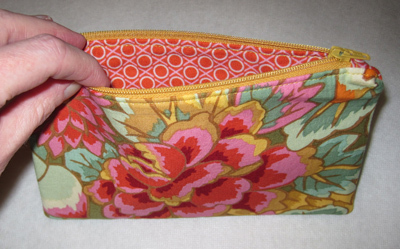 My only modification to the project was the addition of a second fabric for the waistband. For some reason, I just couldn’t image the skirt with all the same fabric. I guess that’s the beauty of making your own! I just got back from a local sewing machine store where I dropped off my latest quilt for Project Linus, an organization that collects handmade quilts and blankets and distributes them to children who are ill, going through a crisis or otherwise in need. I had heard Project Linus is very much in need of quilts for boys, so that’s what I tried to make. My personal palette of mid-tone greens, blues, oranges and pinks doesn’t really scream “boy,” so it was a bit of a stretch. 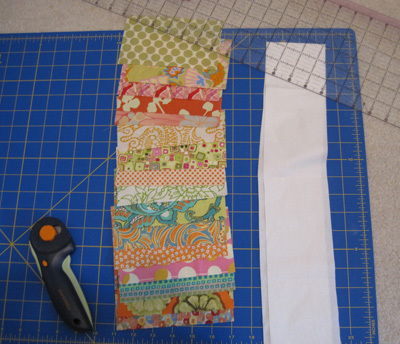 Then as I was nearing the end of the top, I realized I really needed some more of that Alexander Henry fabric. So the project sat in the to-do pile for a while. 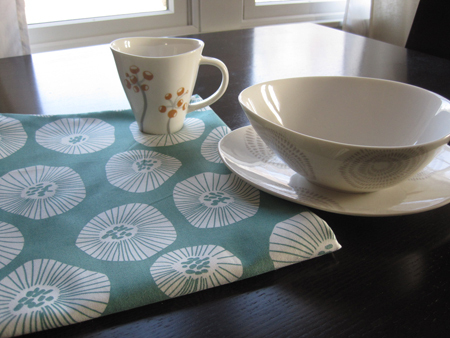 After at least a month the nearly unheard-of happened: the fabric was still at the place where I first bought it! Cabin Arts, in Burlington, Kentucky, had just a yard and a half left. What luck! So I finished up the front, and used a blue fish fabric for the back (fish are masculine, right?). 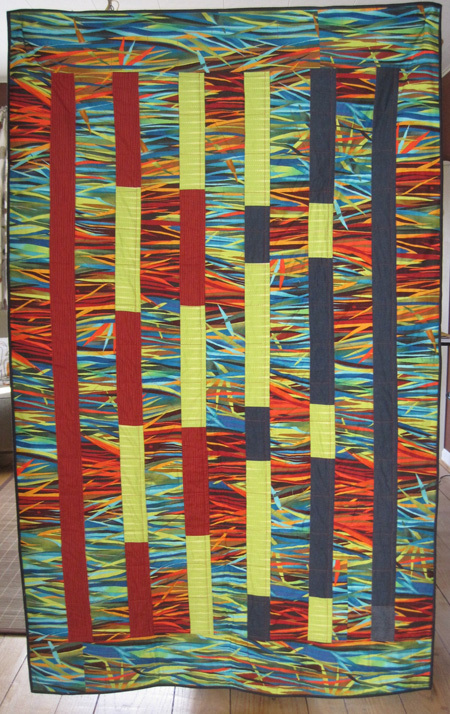 The idea of doing a strip design came from a blog series called A Quilt to Give by Nancy Zieman, who was also making a charity quilt. 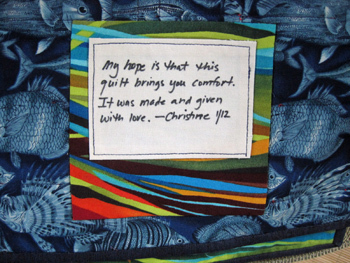 Her quilt was a lot more intricate than mine, but I did take to heart some of her thoughts on charity quilt making. In my own words, those thoughts are 1. Use your good stuff. Those kids deserve it. And 2. Include a label. It lets the child know there’s a person behind the quilt who does care. So I did sew on a label, using the sentiment that Nancy sewed onto hers. Writing on fabric is always tough, and this doesn’t look great, but I wanted to keep it as personal as possible. I don’t finish as many quilts as I’d like and not nearly as many charity quilts as I’d like. But, until I finish the next, I hope that some boy (fingers crossed) will enjoy this one. My hands don’t like to be still. That’s why you can usually find a partially crocheted or hand-quilted project somewhere near me. 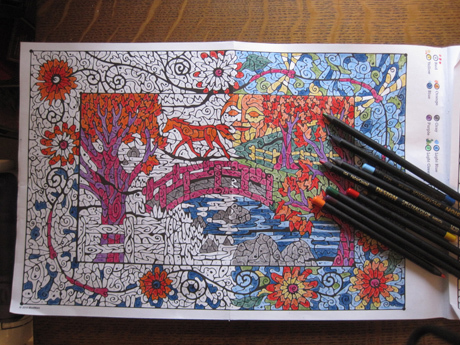 But over Christmas I was reunited with two ways I used to keep my hands busy as a child: coloring and dot to dots. Not just any coloring or dot to dots, mind you. Extreme coloring and dot to dots. My mother had ordered a book of various puzzles while placing a Christmas order with Mindware, a catalog company with the tag line “brainy toys for kids of all ages.” The book included complex story problems, word games, and of course, coloring and dot to dots. The coloring was actually color-by-numbers, which for me made it extra appealing. My hands could be busy while my brain didn’t have to worry about choosing colors and could focus on the family conversations all around me. (It helped to have a niece who received a huge pack of colored pencils for Christmas, too.) 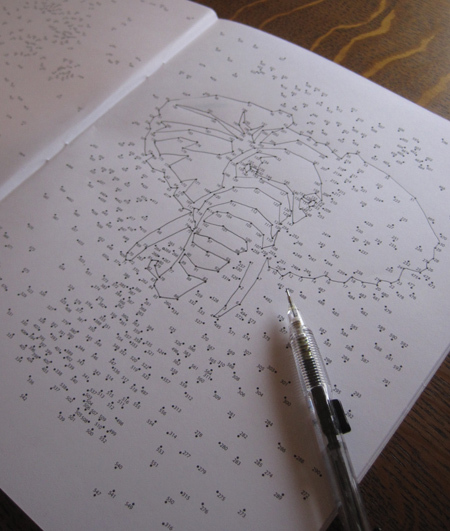 And the dot-to-dots, I mean, who wouldn’t love a dot-to-dot with 300 to over 1000 dots? When I got home, I found myself missing that book, so I ordered a few books (with just the things I liked—not the story problems) for myself. The subjects for each weren’t anything I’m completely interested in, but I ended up with Landscapes for the coloring and Animals for the dot-to-dots. I’ve always admired the crisp look of paper-pieced blocks, with their perfect and intricate designs. 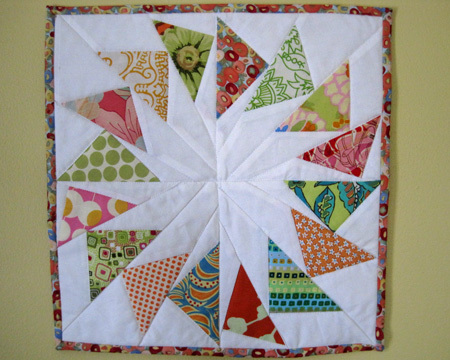 Yet previous attempts at paper piecing left me feeling like I just didn’t “get” it. But still when Quilting from Little Things by Sarah Fielke came to my attention, I was drawn to the paper piecing section. In the book, Sarah explores 10 quilting techniques, presenting a small dolly quilt project on which you can practice the technique, and a second larger, more intermediate take on the technique in the form of a quilt project. So one weekend, I set out to tackle the dolly quilt in the paper piecing section—a circle of flying geese. Having struggled with this technique in the past, I went easy on myself and used a solid fabric for the background—one where the right and wrong sides were fairly indistinguishable. I cut out all my paper shapes. And I started sewing. And then I had to unsew. And then I sewed some more. And then I unsewed. The instruction for the blocks was straightforward and easy to follow. But for some reason, I still kept putting fabric in the wrong place or upside down. As I was struggling, I got to thinking about those visual-spatial sections of IQ tests. The ones where you were shown a 3-dimensional shape and then you had to choose what that shape looked like from a different angle. I dreaded that section of IQ tests. 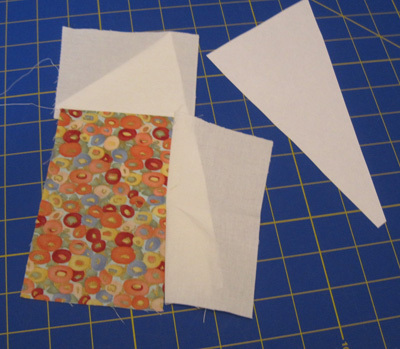 Somehow my dislike of these tests seemed linked to my struggles with paper piecing. For “fun” I went online and found a visual-spatial quiz to take. My husband and I both took the quiz. We both struggled, both got frustrated, both hated every minute of its 10-question length. The results: I bombed (like, much lower than average bombed). He aced (like, got much higher than average…and an exclamation point). The thing is my husband doesn’t sew, and therefore, it’s hard to know whether he’d be good at paper piecing. So I’m calling on all you paper-piecers out there. Are you good at visual-spatial tests? How about you non-paper-piecers? I’d love to hear from you! When my job of 15 years came to an end in November 2011, I knew I wanted to take time off from work. I also knew I was going to have to keep busy in some other way as I adjusted to my new life without an office to go to five days a week. And that’s where the zippered pouch comes in. I had made a couple of zippered pouches earlier in the year, after working on a craft video with Lisa Lam, author of The Bag Making Bible. In that video Lisa demonstrated just how not scary zippers could be, and the sewn zippered pouch seemed like the perfect place to test that notion. So I made a few for myself, pretty much got the hang of them, and then got busy again with work. 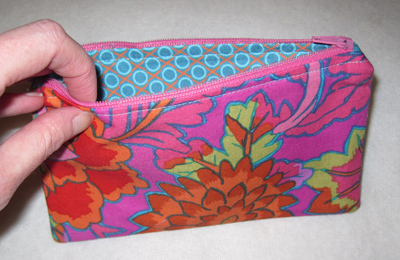 Once November came around, zippered pouches filled a void perfectly. They kept me busy when I needed to do something tangible; they were still a bit of a challenge; and they were useful. 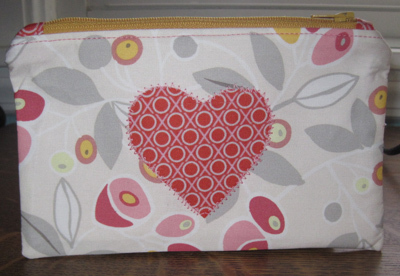 So I began sewing of zippered pouches. Nine to be exact by the time Christmas rolled around. My favorite part was playing with the fabrics and zipper colors. I gave many of those pouches away as Christmas presents (adding a bit of duct tape to the designs for the males in the family). And then I started getting requests from the poor souls who didn’t get zippered pouches. So I made more. And since I’m now to the point where I can make one in about 45 minutes, I whipped one up for the Modern Quilt Guild swap this month, too. Three months into my new life, I’ve started my own freelance business, editing, proofreading, indexing for publishers and authors looking for an experienced editor. I’m relegating sewing to the weekends again (and the occasional slow afternoon). 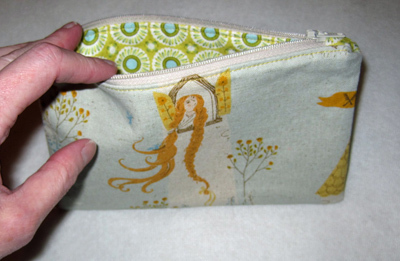 I know I have a few more zippered pouches in me (they are so darn useful), but I’m hoping I don’t need to make zippered pouches again. If I do, though, I just may have to open that Etsy shop I’ve been thinking about.